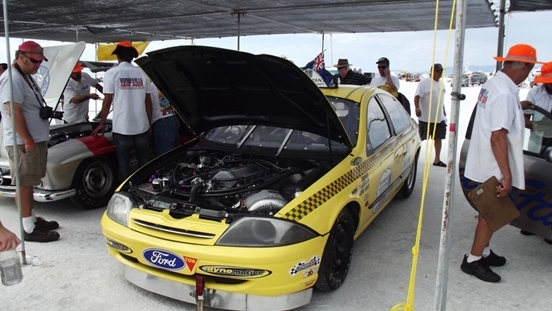 As some of you racers may know, I had the opportunity to attend the Bonneville Speed Week 2012 at the invitation of my counterpart Steve Davies (Chief Car Inspector, SCTA).In all, I spent 10 days working with Steve and his team, and I was thrown in to the deep end straight away. I was involved with inspecting everything from a 112 mph Daihatsu, to high 300’s streamliners. I was also involved with a major incident (a crash on the course) and the follow-up investigation and reports etc. This was an extremely valuable experience, learning all of the rulings and solving a lot of the ‘grey ‘areas of how the rules are interpreted. Even being involved in a (rather messy) protest, was a great learning opportunity. When you are driving/racing your vehicle on the race course, the most important person on Lake Gairdner at that time is YOU! All officials and safety crews are watching YOU! We do NOT want YOU to get injured or hurt in anyway. So it is expected that you present your vehicle and yourself, in the best and safest condition possible. This should ensure that Tech inspection is a pleasurable experience for both you and the inspector. It is VERY IMPORTANT that you read and understand, THE 1ST PAGE OF THE RULE BOOK ,Then SECTION 1 - GENERAL COMPETION REQUIREMENTS, and then, 1.A - TECHNICAL INSPECTION, THOROUGHLY before continuing! NOTE: ALL drivers (Primary and secondary) must complete a ‘BAILOUT’ to pass tech inspection. This requires the driver to show to the inspector his/her knowledge of the race vehicle, and the capability to exit the vehicle .YOU are not under a timed limit for this, only to show that you are able to do so, calmly and safely. 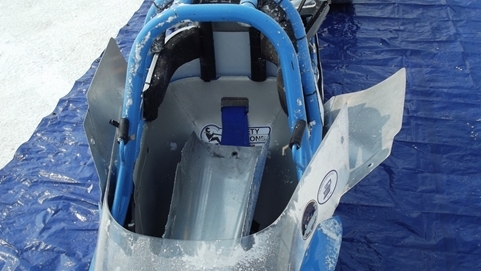 You will be fully “suited up” (Including Helmet restraint),and strapped in as if ready to race. This ‘bailout’ will be noted in your log book, and once you have successfully completed a ‘bailout’, only future changes to your vehicle (or a vehicle change),will necessitate a further ‘bailout’. The ‘bailout’ procedure may be done at a “pre inspection”, if two inspectors are present. This is advised, due to the time consumed at tech inspection on the salt. Now we shall go through the Tech Inspection Sheet (You can download and print a copy here http://www.dlra.org.au/docs/dlra-car-inspection-clasification-form.pdf, in the same order as on the Tech sheet. Also, have your rule book close by, and refer to it as you go through the following. 1. A…..Please have your car in COMPLETE race trim, have two moon discs (if you are running them) removed (diagonally opposite is best), the parachute packed (chute release function will be checked), and any tools (dzus etc.) required to remove any body work/panels for inspection. Also make sure all the required paperwork is done, if not you may be waved through, as not to hold up the line of other vehicles awaiting inspection. 3. Q….Self explaining, but your CB (UHF) and Extinguisher will be checked (your support/pushcar must be presented at inspection also). It is also a requirement to have a flashing light (rotating beacon) on your support vehicle at Lake Gairdner. A ‘spill kit’ is also required in your support vehicle. This should contain(as a minimum); A tarpaulin (1.8m x 1.2m is a good size) to place under your leaking race vehicle, some form of oil soak (kitty litter) a 10 litre bucketful will get you by, a square mouth shovel (for scooping up contaminated salt), some large garbage bags (so YOU can remove the contaminated salt from the lake), some rags, (old towels work well), and any special tools, towing attachments etc. specific to your vehicle. 3. A.2, 3.D.3, 3.A.3, 3.A.1….This is making sure your safety equipment has the correct and current ratings for the class you have entered. 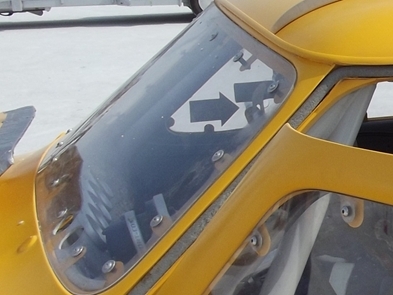 Helmets are to have a Snell SA 2005 tag. (If you need a new helmet, Snell 2010 helmets are now available, and will be current to Jan 1st 2022). NOTE; the support must extend to the forward most portion of the helmet.Tip, when installing your lateral movement restraints, check while wearing your SFI 38.1 device. This will move your helmet further forward than you may think. Here is a good idea if you are tight for getting in and out of your race car. 1. A….The DLRA does not require chassis number stickers at this stage, only your valid DLRA log book is required. 3. 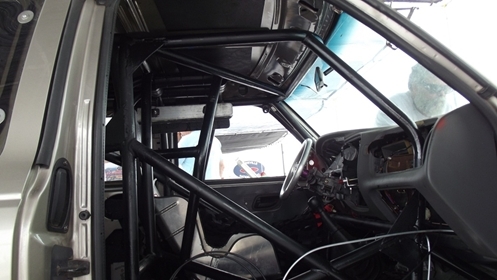 B, 3.B.1….Here the roll cage structure will be looked at for design, tube sizing correct for Class, bracing and gusseting, cross members under seat and legs where required etc. 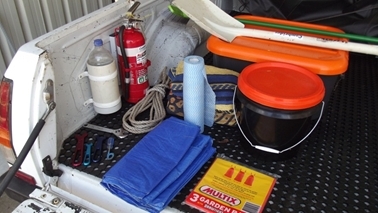 If you are building a pickup or ute, rearward bracing (For example-through the rear window) is required, but if you are building an extended cab pickup /ute (crew cab , Holden Crewman etc. ),the rearward bracing may not be necessary, as there may be enough room in the cabin area to construct a suitable cage. Any queries on roll cage construction, please contact the Tech Staff (See below). The below diagrams missed being included in our current rule book, and are here for you to use as a guide. 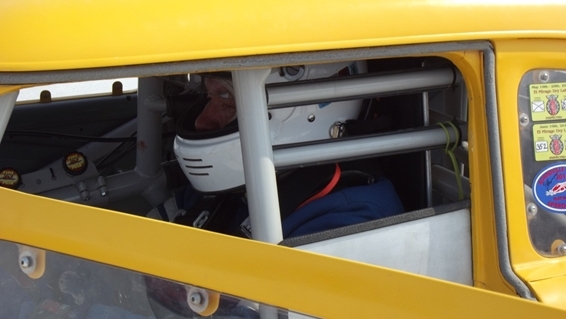 Below is a good example of a cage in a late model Xtracab pickup. 3. B.2….SFI 45.1(for tube) and SFI 45.2 (for Flat areas) Rollbar padding is now required, the old style Foam padding is now banned, the padding must (at a minimum) be placed anywhere the helmet may contact the roll cage, and where ever else you may think necessary. 3.D.1….The driver’s seat must be of a metal/alloy construction(No plastic seats),and if you want to use a composite(carbon fibre etc.) seat please submit details to the Tech Staff (see below) at least two months before the event , or preferably before you buy one. 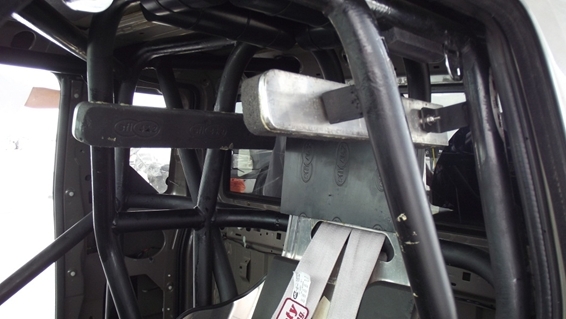 Make sure the seat is solidly mounted (not on seat runners/guide rails) and attached at the rear to the cage. If the inspector can move the seat by just shaking it, imagine how much it will move around in a major incident .Also, no more than 25mm of padding is allowed. 3. 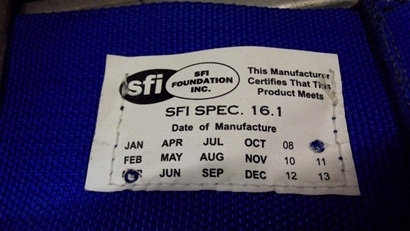 D.2….Your seat belts must have the SFI 16.1 tags, and NOT be more than 5 years old, and in good condition. The SFI foundation only certifies the belts for two years, and it is advisable (NOT a rule) that they be replaced every three years. Make sure they are mounted correctly, as per the manufacturer’s instructions, and also that the mounting position matches the requirements of your 38.1 restraint) Whether they have been used or not, the inspector will only go by the condition of the belts, and the date on the tags. In the above example, these belts have to be replaced in (or before) March 2013. 3. D.3, 3.N….When building your vehicle, install all the switches, levers etc. where you can easily reach them with your arm/ wrist restraints on. NOTE; your restraints must be newer than 2006 (before this date some were made with Aluminium fittings, and these are now banned).Your hands /limbs are NOT allowed outside the roll cage!! You will be checked on this when doing the “Bailout”, See above. 3. L….Here we are checking that the wheel and column are securely mounted, and that all steering components move freely with no ‘binding’ or excessive ‘play’. You may use a ‘removable ‘steering wheel, as long the hub and release mechanism is of metal construction. Any heim joints used must have safety washers fitted (a washer larger than the heim joint) in case of joint failure. 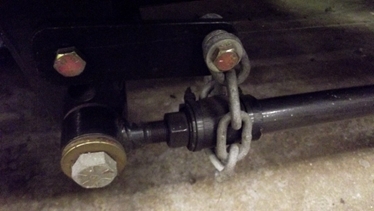 On long wheelbase cars, lakesters and stream liners, a collapsible column or secondary columnstops are mandatory. 3. 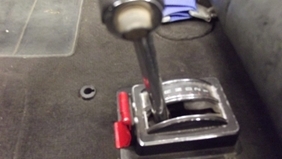 H.1….If you are running an automatic transmission, you MUST have a reverse lockout fitted. A ‘stock’ shifter’s factory button style is NOT a lockout. Below is an idea that is a minimum acceptable modification. A reverse lockout is highly recommended on manual transmissions. 3. J….The preferred throttle cable setup is a ‘Morse’ style push-pull cable. 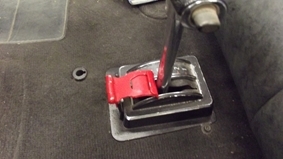 This is to enable a ‘Toe strap’ to be used correctly.OEM (factory) cables and throttles are acceptable, as are hydraulic throttle setups (Note; that if installed,a ‘toe strap ’will not operate in the case of OEM and hydraulic throttles – please make sure you have GOOD return springs). 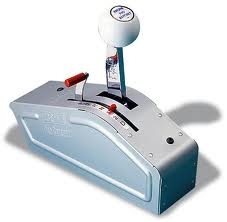 “Fly by wire” throttle systems are to be submitted for approval to the Tech Staff (see below). 3. W….You can use a hand or foot operated brake control, the inspector will check how you operate it during the “Bailout”, See above. 3. D.3, 4.P, 3G….The restraints (arm, leg, window net etc.) will be thoroughly checked. 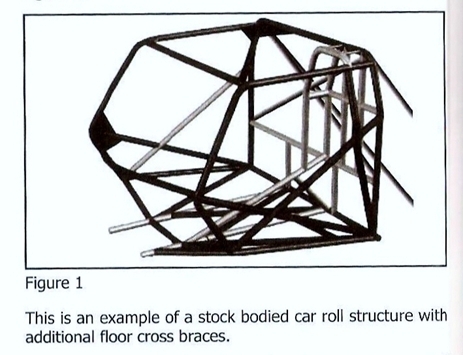 The rule is that NO part of the driver’s body can protrude past the inner plane of the roll cage structure. With a streamliner/lakester/roadster etc., this can be attained by the use of driver position, panelling, and arm and leg restraints. 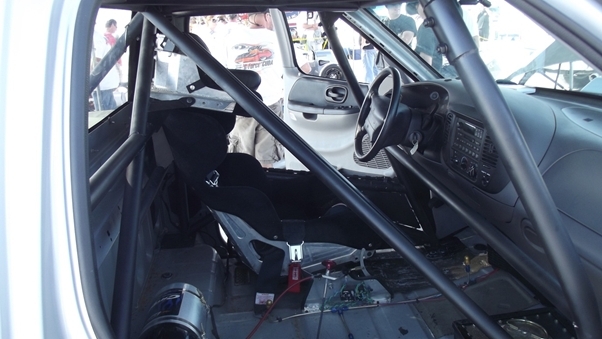 The driver’s limbs must be protected by the roll cage/chassis structure, and any necessary secondary flooring. In an open car (e.g. 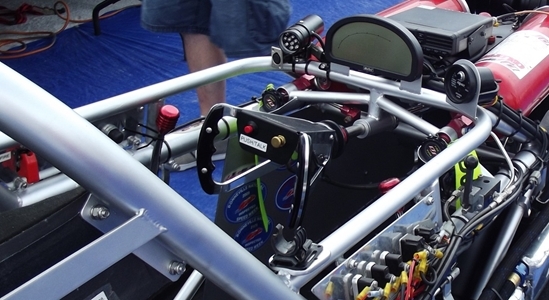 lakester), the arm restraints must be kept as short as possible (remember keeping all the controls as close as possible in 3.D.3), below is an example why. The driver in this incident was unharmed (except for his pride). In a ‘Doorslammer’, i.e., coupe/sedan/ ute, case, the restraints will be checked as if the door does not exist. 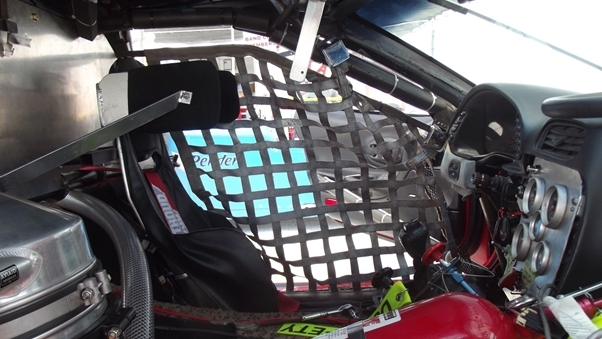 Window nets shall be securely mounted on the inside of the rollcage, and made so they drop down on release. The preferred mounting method is with seat belt hardware(As per manufacturer’s instructions). Spring loaded rods are OK , but must NOT push forwards to release. Below is a good example of a window net. 3. I.2….All fuels are to be isolated from the drivers compartment. This may require a fire wall between the driver and the fuel cell (for example, in a sedan/coupe, the firewall will be where the rear seat is/was). If you have no alternative than running fuel lines through the cabin area, fuel lines can be run through SEALED (from bulkhead to bulkhead) steel tubing. Please contact Tech Staff (See below) before contemplating this method. If you are using a mechanical fuel pressure gauge, either mount it outside the driver’s compartment, or use an isolating diaphragm in the fuel pressure line if mounting in the cabin area. Nitrous Oxide is considered a fuel, and will be treated as such. 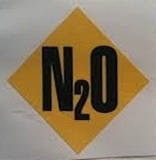 All N2O bottles MUST have their mounting position clearly identified on the outside of the vehicle. All N2O pressure relief valves must vent to the outside of the vehicle via a rigid line. 3. 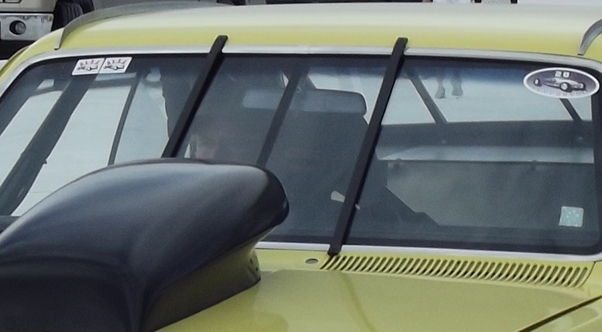 E….A forward facing fresh air vent is required on all cars with enclosed cockpits/cabins. 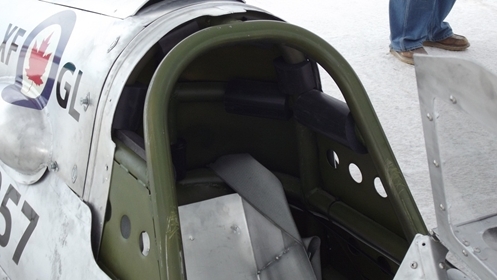 This can be done with a simple 25mm dia tube running from the front (in the grille area for example) of the vehicle through to the cockpit via the firewall. Another example for doored cars is below. 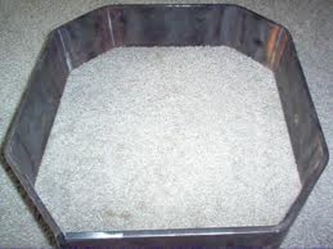 Production type cowl vents (where the original car ventilation comes from) must be closed off,(see 3.F ,Firewall) and an alternative fresh air intake provided (as shown in the below photo). A fresh air breathing system may be used, but NOT compressed oxygen. Any lines used in a fresh air system must be covered with fire retardant protection (Fire sleeve etc. ).Any factory door locks need to be disabled/removed, as well as the factory steering lock. And any aftermarket (non OEM) door handles need to be clearly marked. In front engine vehicles, the rear of the scattersheild/bellhousing must be in front of the driver’s knees, and obviously keep the drivers area free from sharp edges and any other brackets etc. 3,Q….If you are running in a class where the record is less than 200mph,you will need a minimum of 10lb (4.5 kg) agent, with two nozzles aimed at the header/oilpan area, and at least one aimed at the driver (But NOT at the face) .If you are running in a class where the record is more than 200mph,you will need a minimum of 11lb(4.7kg) agent and a min of 5lb(2.2kg)agent of this has to be aimed at the driver. NOTE; Be aware that the bottle weight is NOT the weight of the fire agent contained in the bottle. This is a minimum!! !You can have as much fire agent as you want in your vehicle! !There are a few alternatives with fire agent (read the rule book), but unfortunately NO halon agents are allowed in Australia. Use good solid brackets to mount your fire bottles (hose clamps/T bolt clamps etc. won’t pass).All of the fire lines and fittings MUST be metal. 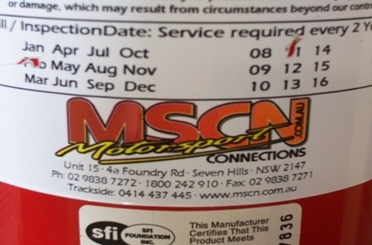 The inspectors will need to see your inspection tags/labels, so keep this in mind when you are mounting your bottles. It is a good idea to clean out the extinguisher lines and nozzles on a regular basis, using high pressure air (and some soapy water can help along with the air).Any queries with fire systems, please contact the Tech Staff (See below). 3. I.1….If you do not have a factory stock fuel system, a fuel shutoff within the drivers reach (while wearing restraints etc.) is required. 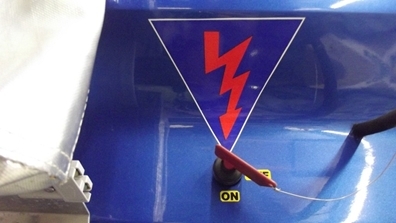 All electric fuel pumps must have an on/off switch that the driver can reach, a switch in the oil pressure system that shuts off with lack of oil pressure, and an INERTIA switch in the fuel pump circuit (It is advisable to have this switch wired to cut off the ignition also). 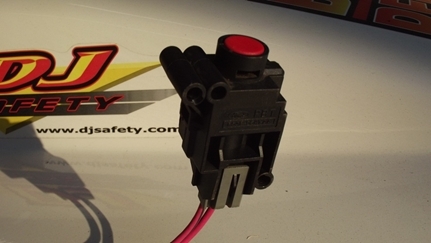 This inertia switch will be checked at inspection for operation .These inertia switches can be found in wreckers from late model cars (Fords have them), or new from Summit Racing in the USA, and possibly, Rocket Industries here in Australia. If you are running a mechanical fuel pump, it is advisable (NOT a rule yet) to still have an INERTIA switch, but on the ignition circuit. Any rotating shutoff valve (in the case of mechanical injection for example) must have a positive stop. Diesel equipped vehicles must have a mechanical shut off valve that will cease fuel supply to the injectors. 3. 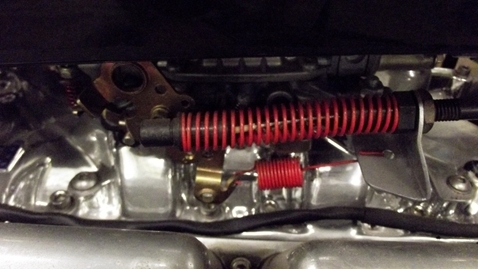 J….The throttle operation will be checked, and you must have two throttle springs (per carburettor)and fuel injection systems must also meet this rule, NOTE; the small spring on the throttle shaft (as per Holley), does not count as a return spring. 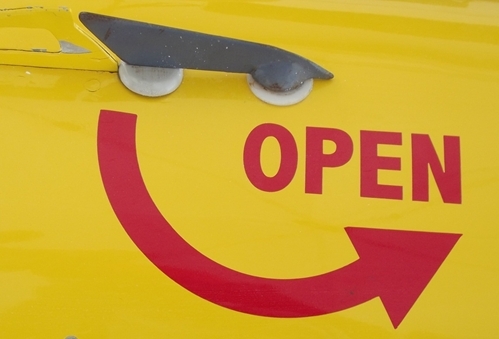 An over centre stop is also required; this is more commonly required on fuel injected engines. The inspector will ask the driver to operate the throttle. 3. I, 3.R….Obviously, any plastic fuel lines are prohibited. 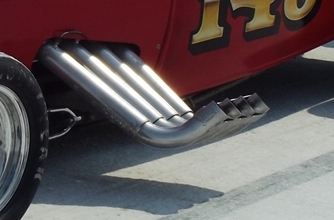 All rubber fuel lines must have metal hose clamps fitted at connections. 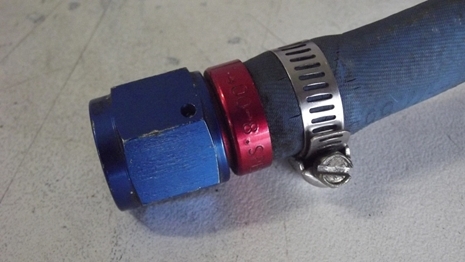 If you are using the “400 Series Pushlock” hoses and fittings (NOTE: this hose is not suitable for unleaded fuels), a metal hose clamp must be used over the hose end. This clamp does not need to be over tight, just ‘nipped up’. The cooling system also must have metal clamps on all rubber hose connections, and NO use of plastic tubing is permitted. Also note that No flammable additives are permitted, (GLYCOL and GLYCOL based coolants are flammable when in vapour form), and Glycol is also banned for environmental reasons. Water, and Redline brand “water wetter” additive, are the acceptable coolants. 3. F….Your firewall needs to be completely sealed, NO holes. This includes the trans cover/floor area, to protect YOU from fire. If you have a non-production firewall, it must be made from metal/alloy and be a minimum of 0.060” (1.6 mm) thickness. 0.095” (2.0 mm) is recommended. 3. P….Make sure that the exhaust/headers are well mounted, and are not aimed at the track surface, the tyres or the drivers compartment. If you are running ‘Zoomies’ ensure they are well braced. 3. I.2….If you are running Nitrous Oxide, this is where the inspector checks the mounting of the bottles (they must be mounted solidly, and outside the drivers compartment).Also the pressure relief valves, and venting to outside of the vehicle will be checked. You must also have the location (and number of bottles) clearly marked on the exterior of your vehicle. 3. X….If you are running a blower (e.g. 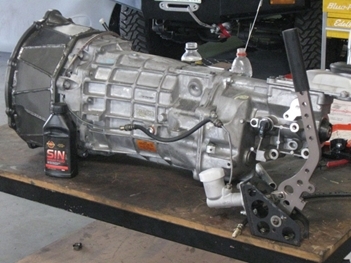 6-71 GM style), an SFI type blower restraint is required. 3. O….If you are using a non-automatic transmission (including Lenco, etc. )a billet flywheel is required. No cast iron/aluminium flywheels are permitted. 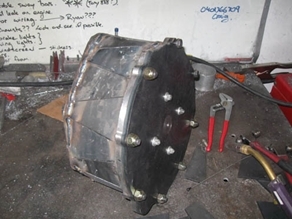 A 360 degree ¼ inch (6mm) thick flywheel/clutch shield is required (see photo above, this is why scattershields are required, to contain clutch/flywheel failure. Yes, it happens! If this was a factory cast iron or alloy bell housing, how good would your feet/legs look? This scattershield has done its job). This can be a problem for some vehicles where one is not available (from Lakewood, McLeod etc. ).It is possible to manufacture your own (see pic below), or construct a 360 degree ¼”x3”-4”wide (6mm x 75mm-100mm wide) band surrounding the flywheel/clutch area. 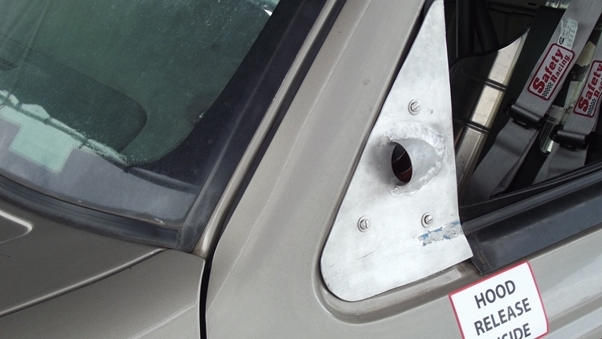 Or on vehicles that have extreme limitations a ballistic blanket type shield may be approved. Either of the two previous mentioned designs are to be approved by the Tech Staff (See below), prior to construction. Some examples are shown below to show that it CAN be done. 3. H….With an auto transmission, it is preferred to have a ballistic blanket rather than a shield. This will help contain any debris in a trans failure. These are reasonably priced from a range of suppliers/manufacturers. 3. I….Any fuel line passing the clutch/flywheel area requires extra shielding. Either in heavy wall tube, or protected by steel plate, or mounted outside the frame rails. It is advisable to run any other lines (Fire, brake, water etc. )and battery cables in this area, the same way. Remember the hole in the scattershield above? This is why the extra shielding. The scattershield has done its job, it has slowed the escaping debris as not to harm the driver, but the debris can still damage fuel lines etc., in the plane of the flywheel/clutch. 3. 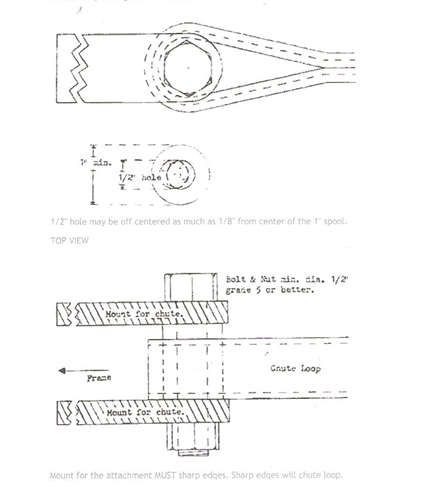 S….A 360 degree driveshaft safety loop is required in the front 25% of the shaft. This needs to be (as a minimum) 1/4”x 1” (6mm x 25mm) steel. 2. F….Please read the tyre section of the rulebook carefully. The choice of tyres will depend on your class record. For example, if your class record is 140mph, you could use an H rated tyre (but if you can run 180mph-you will need a VR or ZR tyre).Drag race front runners are acceptable up to, BUT NO MORE THAN, 200mph.All cars with a class record over 200mph must have purpose built landspeed racing tyres. The inspectors will also check for tyre to body/chassis clearance, to make sure there is no chance of a tyre being damaged during use, by rubbing or sharp objects etc. As a tip, filling your tyres with Nitrogen will help keep them cooler, and keep the tyre pressure at a more constant level. 2. G….This section causes some confusion to many racers. I’ll try and make it simple for everyone. 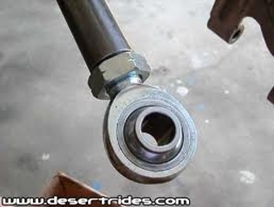 If your class record is LESS than 200mph,you may use OEM(factory) wheels/rims (it is recommended that the centre and rim be fully welded together),NO closed end(Acorn style) nuts are permitted, the lug nuts must have a minimum of 5/8 “ (16mm)thread engagement. 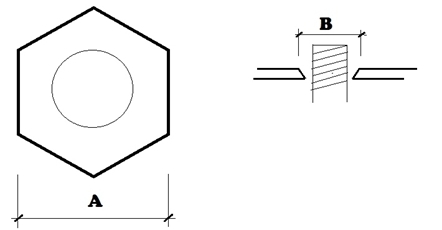 The smallest part of the hex must be larger than the widest part of the female taper in the rim. ‘A’ must be larger than ‘B’. If you have rims 17”or more in diameter, and /or tyres more than 29”diameter, you must follow the below ruling. (No matter what speed your class record is, or how fast you may run). If your class record is MORE than 200mph (or you have oversize rims and/or tyres as stated above), you must have a minimum of FIVE ½” (12.5mm) studs (not bolts), the hex nuts must be 1” hex, and the same as above-the smallest part of the hex has to be larger than the widest part of the tapered seat, and still a minimum 5/8” (16mm) thread engagement. The rims shall be either OEM, with the centre fully welded around the circumference to the inner of the rim. (It is highly recommended that this is done by qualified wheel repairers/manufacturers), or specially ‘made for racing ‘wheels. ALLOY WHEELS-Regardless of speed; there shall be a steel washer between the lugnut face and the rim face, to prevent the lugnut”chewing” into the alloy. This can be done by using large washers (as used on Centreline/Weld style wheels), or a large round ¼”plate that all 5 lug nuts pass through. Some purpose built alloy racing wheels (built for formula Vee etc. ),have a tapered steel insert fitted for the lugnut to seat on, these will be OK up to 200mph (but must still have the smallest part of the hex larger than the widest part of the taper). 2. F….All valve stems must have metal valve caps, and tubeless tyres/rims must have metal valve stems and caps. 2. G….If you are using “Moon Discs”, they must be attached to the rim with either 6(six) machine screws (small bolts) or 3 (three) Dzus fasteners. (this is a minimum, you can use more),NO hubcaps are allowed (including the ‘snap on’ style moon disc lookalikes-unless they are fastened as previously mentioned). 3. L., 3.T….Here the inspectors will be checking the steering gear, Linkages/heim joints, clearance for free operation, kingpins for wear, etc. Also any welding that has been done on any steering gear will be looked at. It is possible, that you may be asked to provide certification on critical welds if a potential problem is observed by an inspector. All fasteners used in the steering/suspension need to be min Grade 5 bolts along with ‘ Nyloks’, or safety wired, or splitpin castle nuts etc. 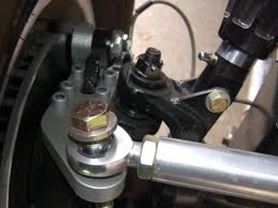 If you are running more than 20 degrees caster, steering stops will be required, steering stops will also be needed if the tyres are able to make contact with any other components when the wheel is turned. 3. T….All heim joints must have safety washers.Aluminium heim joints and Teflon lined heim joints are banned, so use the solid type (steel inner & steel outer). 2. D….Shock absorbers are required on each wheel that is suspended/sprung. 3.S….Any trailinglink, four bar set up, ladder bars etc,are to have a metal ‘sling ‘attached near the front attaching point, to catch and stop the bar digging into the race surface upon a bolt/weld failure. These slings must be ¼” (6mm) min dia, and can be made from metal strap, steel cable, chain, etc. 3. I….Here the inspector will check the mounting method, and position (making sure the driver is protected etc. ), of the fuel tank, and any water tanks fitted. 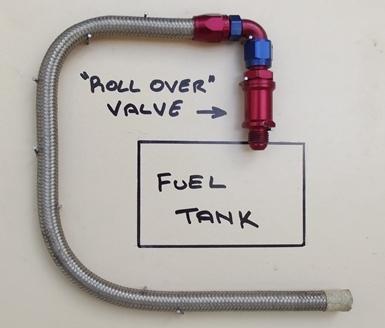 Fuel cells/tanks must be fitted with a “roll-over” valve, as to stop fuel leaking during an incident. The preferred method is shown here (Diagrammatic only), the valve is fitted to the cell/tank, and with tube or hose run to one side of vehicle, down vertically, then to opposite side of vehicle. This way no matter how the vehicle is sitting, there is minimal chance of leakage from the cell/tank. If you are using a water tank, it is a good idea to keep it out of the driver compartment. Or make sure that there is a relief valve (radiator cap) of a lower value than what is in the cockpit. 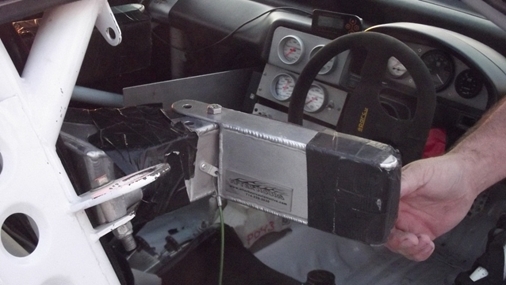 Vent to the outside away from the driver (hot water can burn, even through a good fire suit). 2. J, 3.K….If you choose to use ballast (lead, heavy steel etc. )You can in all classes. The inspector will ask to see where it is mounted and check that it is secure. Make sure you bolt it in to the frame/chassis solidly. It is advisable to mount any ballast as low as possible in your vehicle. Any number of batteries is allowed, they must be mounted with metal brackets and fasteners. A plastic battery box alone is not acceptable. 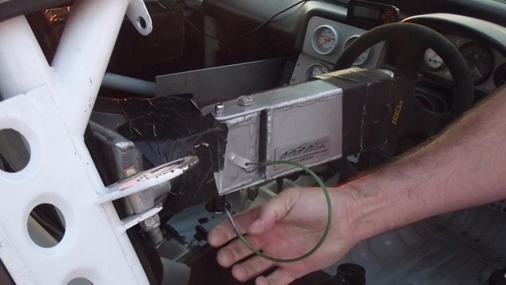 You can mount the battery in the driver’s compartment, but it must be secured and sealed in a leak proof box that vents to the exterior of the vehicle. The inspector will ask to see the battery. 3. M….If your class record is over 175mph you will require one parachute. If your class record is over 300mph you will require two parachutes. 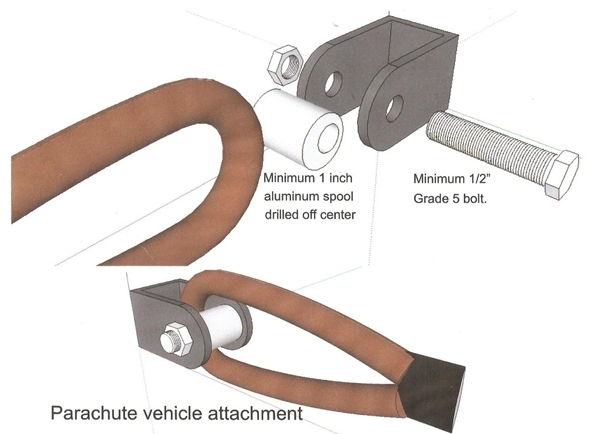 The chute/chutes must be mounted as per the manufacturer’s instructions, A few manufacturer’s instructions are shown here.Note the 1” (25mm) diameter mounting, this is to take unnecessary strain off the canopy lines at the mounting point. 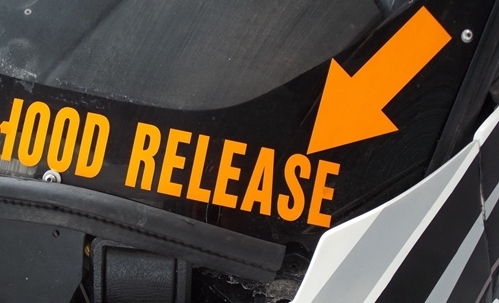 No “D” shackles are permitted as a parachute mounting. 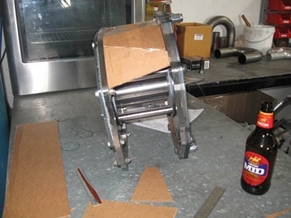 The inspector will ask you to “pull’ the chute, so its operation can be observed. 2. I….Your race vehicle must be equipped with either a push bar or a readily accessible (and clearly marked) towing attachment. This is so that your vehicle can be pushed/towed clear of the course if needed, by any official or other push/tow car. 2. K….Your vehicle must be of a neat and tidy appearance. If the vehicle is white/silver or unpainted, you must have a contrasting colour on the bodywork. White and silver cars can become ‘invisible’ on the white salt flats. 2. L, 3.I.2….Generally, your membership number will be your race car number. Have your number and class clearly marked with letters/numbers a minimum of 3” (75mm) high. Any Nitrous Oxide bottles need to have their position CLEARLY identified (by means of decals etc.) on the exterior of the vehicle. 4. X….If the class you are competing in requires roof rails, the inspector will check that they are suitably attached. Make sure when you install roof rails, that they are parallel, they are to help provide straight line stability. 3. U….If your vehicle has windscreen wipers, they must be removed. 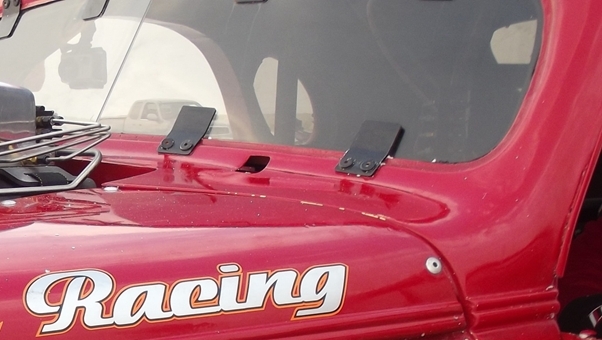 If your class record is over 175mph window tabs or straps need to be fitted. (Here are some examples). 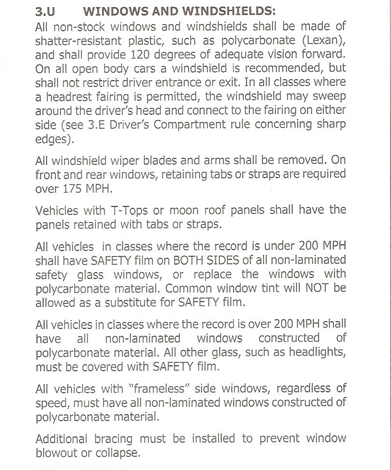 IF your vehicle has polycarbonate (Lexan) windows, you may be permitted to run without window tabs/straps, provided the windows are mounted SECURELY! (An example in below photo). 3. E, 2.M…. 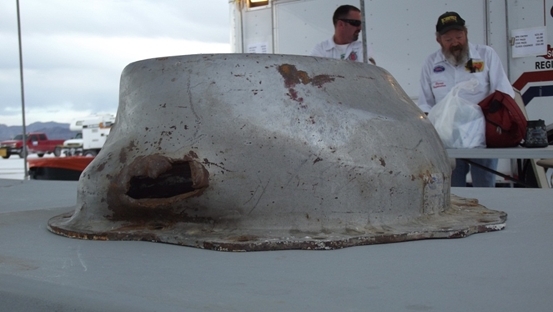 The inspectors will check your door/doors, any fitted escape hatch, and any canopy (streamliners etc. ).They must be able to be opened with ease (inside by the driver, and outside), and without the use of any tools or unnecessary force. 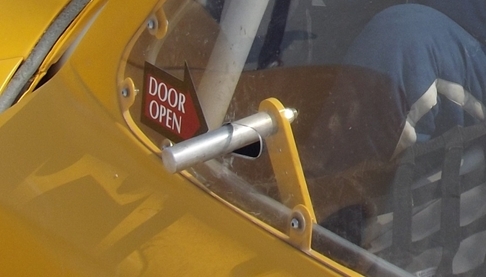 ALL non-factory door handles, and ALL escape hatch and canopy latches MUST be clearly marked. It is preferred that all factory hood/ bonnet latches are removed, and replaced with bonnet pins/Dzus fasteners etc. You must have the hood/bonnet release CLEARLY identified. In an incident, rescue crews need to get to you as fast as they can.They do not have time to be guessing how to open your vehicle, or go playing hide and seek looking for battery switches etc. 3. K….A main battery disconnect switch must be fitted to the front or rear (the rear is the preferred position), it must be a mechanical (no electric cut-out switches permitted) switch. The switch must be easily accessible, and be CLEARLY marked. Well guys and girls, now you have reached the part where (If you have read and followed the rulebook carefully), you will be issued a “PASSED “decal to apply to your race vehicle, and be able to participate in the greatest sport on the planet. You may be given a list of items that need to be rectified before passing, and in extreme situations (for example, if your vehicle is not compliant with the rules, or just plain unsafe), you will not be permitted to compete. We do not like turning racers away, but in the interest of safety (for you and the DLRA), sometimes, we have no alternative. Here is some additional information that may be helpful. The only FIA rating that cross references to SFI is FIA8856-2000, which equals an SFI 3.2A/5. Is 10 seconds long enough for you to safely bring your car to a stop and get-out? Windows:…. The below is the current and correct ruling (not as printed in the 2013 DLRA rulebook),If you are building a new car keep this in mind.This will be the rule in the 2014 book. Bob Ellis… Email is the preferred method, please feel free to include photos of your query... cambridgemotorsport@bigpond.com, or phone 0426 103 040. We can direct you to an inspector in your vicinity to precheck your vehicle. You will still have to pass inspection at the race meet. A ‘precheck’, is only to advise you of what may need to be corrected, and assist you in building your car correctly. 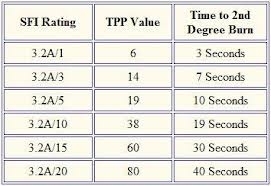 I hope this information helps you to build ,and race, your car safely.